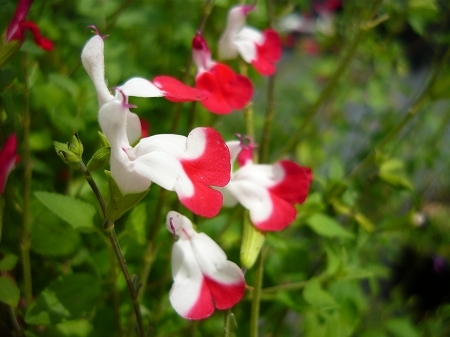 Hot Lips Salvia (s. microphylla x grahamii) Ornamental salvia variety features bi-colored blooms of red and white. Blooms change colors from pure red, pure white, and bi-colored depending upon the season and temperature. Attracts hummingbirds to the garden. Long season bloomer. Very heat and drought tolerant once established. Reported to be deer resistant, forms a small bush 3' - 4'. Perennial zones 7-9. Live starter plant in 3 inch container. This plant is enjoyed for it's variable blossom color in shades from white to red and bi-color too. It is more red when it receives full sun and white in indirect light. You will see the colors change if you have had cloudy days. A non-stop bloomer that fills in a nice size area. Well used by Hummingbirds! Requires little care. I couldn't find these locally so I ordered thru the mail. First timer! They are amazing. They grew very fast and they are the hummingbirds favorite! I've just ordered more to bring to our Arizona home.